CheckAlt today announced Gulf Coast Community Bank has renewed its partnership with CheckAlt to process all deposits made at Gulf Coast’s ATMs and branches, including in-clearing items and outgoing returns. The renewal agreement also includes Gulf Coast continuing to offer CheckAlt’s Business Capture solution to Gulf Coast’s business customers. Gulf Coast Community Bank is a full service commercial bank located in Pensacola, Florida with five branches throughout northern and southern Escambia and Santa Rosa Counties. By having a single item processing stream for all capture points within the financial institution, Gulf Coast can easily integrate processing information into their core system, as well as take advantage of features such as duplicate detection across all of the bank’s capture points. For more information about CheckAlt’s Image Item Processing, Duplication Detection technology and white label Business Capture, please visit http://www.checkalt.com. Gulf Coast Community Bank officially opened on July 3, 2003 in a beautifully renovated space at 40 North Palafox Street in downtown Pensacola. By 2008, we had five locations with a footprint covering northern and southern Escambia and Santa Rosa Counties. Today, we open accounts daily and are lending to qualified borrowers throughout the community. All of our offices offer a complete line of banking services; which include mortgages as well as our own in-house brokerage service, offered through NBC Securities, Inc. / RBC Capital Markets. We are proud of our team of banking professionals who understand that customer service and satisfaction come first! All coupled with a smile, a handshake, and a focus on personal relationships. 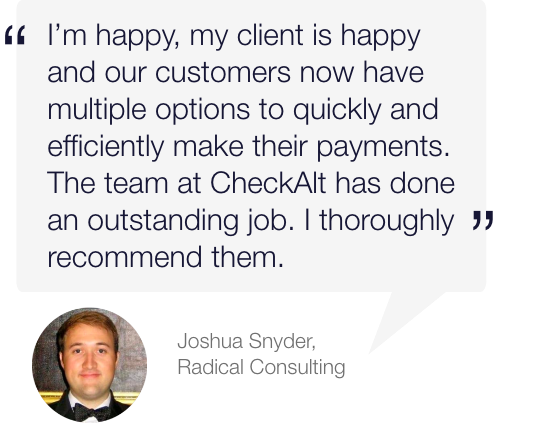 CheckAlt is a leading provider of financial technology solutions such as eChecks, Remote Deposit Capture (RDC), Mobile Payments, Lockbox and Image Item Processing. We help financial institutions expand their capabilities, improve processing efficiency, reduce costs and mitigate risk from all capture points. Our innovative white label payment solutions help financial institutions attract and maintain high-value commercial and small business customer relationships. We help all types of merchants who need an economical and more efficient way to get paid. Visit http://www.checkalt.com for more information.